The Gunner is locked, loaded, and ready to ride. We pit Victory’s latest cruiser against its Harley rival in this battle between American V-Twin cruisers. Find out how the Vic stacks up in our 2015 Victory Gunner Comparison Video. Its tank concaved, a raised spine running fender to fender, black stacked exhaust and 24-spoke wheels make the 2015 Gunner look like it wants to go even when it’s sitting still. You’d swear it’s much longer than the Softail Slim though there’s only a 0.4-inch disparity in their wheelbases . From the back the Gunner looks thinner, the primary cover of the Softail Slim jutting out on one side, its air cleaner on the other. Climb into the Gunner’s saddle and there’s more room to stretch your legs than the Harley, the reach to its bars leaves you leaning just a touch forward. Its seat comes up in back to form a little lip, making it more prone to creating pressure points faster than the flatter seat of the Softail Slim. “The Gunner’s ergonomics were a better fit for me. Ironically, it felt slimmer behind the controls than the Softail Slim, with a more slender fuel tank and unobtrusive air-cleaner cover. I didn’t feel so low to the ground either, with more room for my legs,” replied MotoUSA’s Managing Editor, Bart Madson. This sense that the Victory Gunner is the slimmer bike of the two was proven on our scales, the 673 pound curb weight 31 pounds lighter than the Harley. Throw in an engine with a few extra cubes into the equation and you’ve got a bike that goes from 0-to-60 0.5-seconds quicker and continues to open the gap through the quarter-mile. It ruled the dyno, peaking at 101.3 lb-ft of torque at 3000 rpm. The Freedom 106 hits its sweet spot between 2900 and 3200 rpm, generating over 100 lb-ft of torque in that range. Its spread of torque is generous throughout the rev range as it pumps out over 90 lb-ft from 2300 to 4700 rpm. One thing it can’t do like the Twin Cam 103 is pick back up from super low rpm as it chugs more than revs. This might be in part to the fact that fueling on the Harley is a tad better as the Gunner has a harsher feel at the throttle. And while the solid-mounted V-Twin idles with little vibrations, a buzz creeps into the bars and tank in mid- to high-rpm. “Engine power from the Victory is better across the powerband. It’s not an overpowering disparity, but definitely feels like it has the edge on its American V-Twin rival,” said Madson. Harley Softail Slim measuring 334.5 pounds compared to the Victory’s 315.5-pound distribution on the front. Thanks to a 25-inch seat height, the Gunner’s center of gravity is low enough so transitions roll smoothly. Banked over, its Dunlop 491s are tacky and help the bike track true in turns. At 673 pounds, it’s still a weighty bike with a lot of mass, but it handles well enough to get a good rhythm down the mountain while the Harley demands riders to be more exacting and deliberate with every turn. “Handling there’s no real contest here. The Harley’s lack of cornering clearance makes the Gunner seem like a CBR600… Well, not really, it’s still a big, heavy cruiser, and it does drag its pegs at lean too – but unlike the H-D it doesn’t feel like you’re pushing your luck at every corner,” said Madson. With plenty of 25 mph hairpins and switchbacks along our Oregon mountain route, responsive brakes are a rider’s best friend. Both editors were sold on the feel and power of the Gunner’s front brake, a firm initial bit followed by consistent power. But it doesn’t take much pressure to activate the rear, the two-piston caliper exerting plenty of bite on the 300mm floating rotor. The Gunner’s back brake has a tendency to lock up during simulated emergency stops. This is where both testers appreciated the ABS safety net offered by the Harley, and ABS is not an option on the Gunner. Victory’s cruiser does benefit from a strong dose of engine braking when it’s dropped down a gear, and it offers convenient five-way adjustable brake levers. But the unit we tested did have an annoying whine coming off the front we believe was a dusty rotor, though it wasn’t noticeable in any of the other Gunners we rode recently at the press launch. at 5.1-inches and damps the ride similarly. On the rear, the Gunner’s solo shock springs back faster, the ride a little firmer as it resists bottoming better than the Softail. 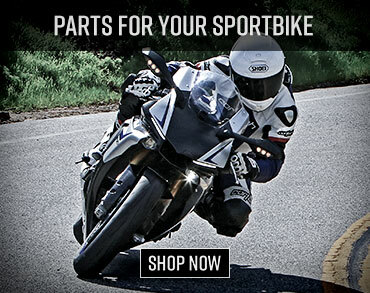 Overall the Gunner’s suspension keeps the bike composed and the rider comfortable and in control. And while we appreciate the ride quality the Gunner’s suspension provides, it shifts loudly and gear engagement is harsh. You can feel it notch into place with every shift, the mechanical pairing even more noticeable in lower gears. The abrasiveness becomes more noticeable when you’re on another bike. On the flip side, the gearbox hits its shifts reliably and never slips out of gear. It eases into neutral without complaint, too. Teamed with a clutch lever that engages almost immediately upon release, the Gunner launches aggressively off the line. In the end, though, the Harley’s transmission is a bit more refined. Seeing how Victory’s design team sought to keep the Gunner as streamlined as possible, it’s no surprise instrumentation is fairly sparse. A solo round dial is perched off the top triple clamp, the analog speedo it houses up higher than the Softail Slim’s tank-mounted console and therefore easier to read at speed. It contains a variety of light-up symbols, turn signals, low fuel, high beams and others. It also has a digital window that can be toggled to display rpm, trip meters, and odometer readings. Among them is a gear indicator that doesn’t always display correctly as sometimes there’s a lapse as it catches up to shifts. It also indicated it was in neutral a couple of times at a stop when the bike was still in gear. And while Harley still sets the standard for fit and finish, the Victory Gunner with its blacked-out engine, frame and pipes and its metallic paint job sports its own racy, contemporary look. 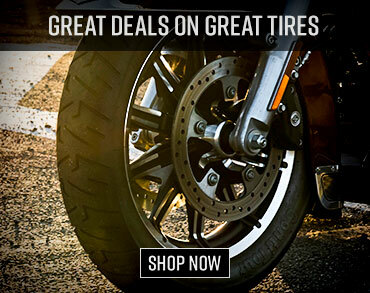 “I do like the Harley’s wire-spoke wheels, but the contrast cut hoops on the Victory are eye-catching and the raised white lettering on the tire sidewalls are just like ones on dad’s old Pontiac – you know, the one he defiantly hung onto until having to sell it for (sigh) the family station wagon… Yep, Victory’s muscle car tire nostalgia worked on me,” added Madson. After spending a couple of weeks on the 2015 Victory Gunner and the 2014 Harley Softail Slim, we’ve gravitated toward the attributes of the Gunner more so than the Slim. Its engine provides more power, pushing out almost 17 lb-ft more on the dyno. It hits freeway speeds a half-second quicker and has its own distinct drumming cadence at speed. The Gunner tilts into turns with less effort and allows for more generous lean angles. 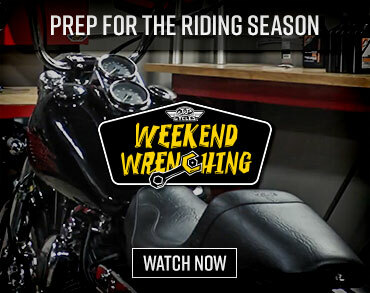 We give the edge in transmission performance to the Softail Slim and appreciate its ABS, but prefer the ride the stiffer back spring of the Victory provides. Throw in the fact that the Gunner sells for four K less than the Harley and it’s a lot of bang for the buck, and a more scintillating ride for less money adds up to a winner in our book.